ZZ383 - Big-block-style power from a small-block engine! If you’re looking for a small-block Chevy that makes big-block power, we’ve got the engine for you! 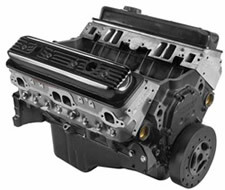 For the ultimate GM Performance Parts small-block crate engine, choose the ZZ383—a combination of Fast Burn aluminum performance heads and a 383" stroker small-block that can add up to 425 horsepower and 449 lb.-ft. of torque. A carefully engineered balance of torque-producing bottom-end power and horsepower-inducing Fast Burn cylinder heads combine for the ZZ383/425’s stellar performance statistics. The Fast Burn heads have large 2.00"/1.55" valves and specially designed chambers that draw in lots of air and fuel, burning the mixture quickly and completely. It’s a combination that generates great mid- and high-rpm power, which, when combined with the 383 cubic inch displacement, creates an awesome all-around performer. The ZZ383 has a specially modified engine block and 3.80"-stroke crankshaft, which produce 383 cubic inches of pure performance. The reciprocating assembly is comprised of heavy-duty components including a 4340, nitrided, and induction hardened forged crankshaft, and unique, heavy-duty powdered metal rods. It’s 425 horses of bulletproof performance. With the ZZ383/425, you get the power of a big-block with the size and weight of an aluminum-headed small-block. If you’ve never driven a car with a stroked small-block and the top end components to support it, now is your chance! NOTE: Distributor with melonized steel gear MUST be used with long blocks and partial engines with steel camshafts, or engine damage will occur. We recommend HEI distributor P/N 93440806. Requires addition of carburetor, ignition, water intake manifold, fuel pump, water pump and starter (not included). 425-horsepower rating achieved during GM testing with high-rise single-plane intake manifold P/N 12496822 and a 750-cfm Demon carburetor with vacuum secondaries. GMPP dual-plane intake manifold P/N 12366573 may be used to avoid hood clearance problems, but peak power may decrease by approximately 15-20 horsepower. Comes with 12.75" automatic transmission flexplate. Requires 1986-1999 350-style externally balanced flywheel for manual transmission. See chart on page 171.